The most perfect blueberry muffin recipe ever! 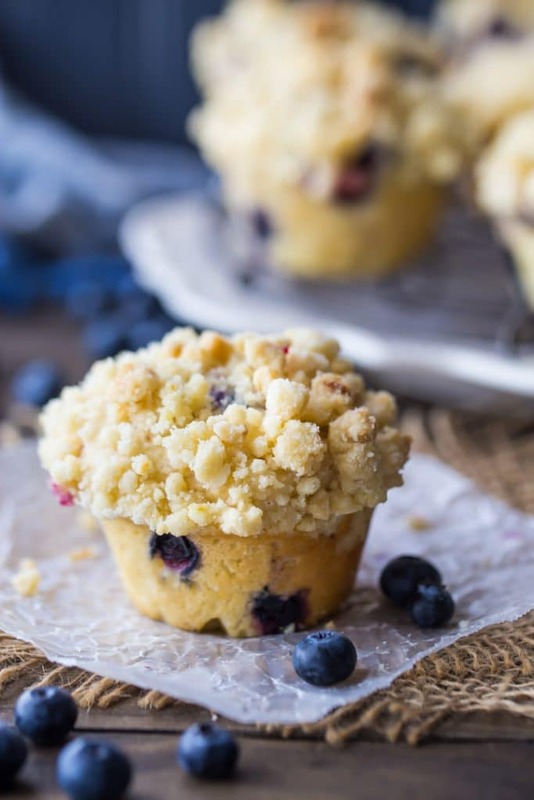 These muffins are light and moist, studded throughout with sweet berries, and sprinkled with a crunchy, buttery streusel crumb topping. They’re quick and easy to make, so whip up a batch for breakfast or brunch! Wow. All I can say is, I really hope you guys like blueberry muffins, because an awful lotta love has gone into this post. I think my family wants to kill me. I have been force-feeding them blueberry muffins for weeks. And my neighbors too. This recipe has been tested, tasted, tweaked, and re-tested so many times I’ve completely lost count. But the good news is, I really, really, REALLY think I’ve nailed it. 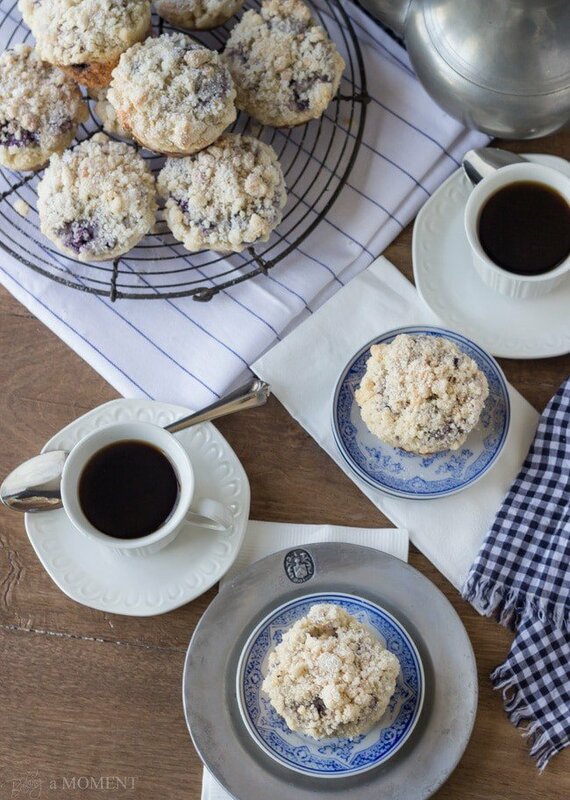 These are the blueberry muffins of your dreams. They are tender. They are buttery-tasting. They are studded throughout with sweet berries. They are light-as-air, thoroughly encrusted with crumbly streusel, and, well- just look at them! I hate to toot my own horn, but I mean, come on! Are those not the most gorgeous blueberry muffins? How about the shape on those beauties? Is that not exactly what you’re imagining when that blueberry muffin craving hits? Blueberry muffins fall into that baking category known as “quick breads.” They are a bread that doesn’t have yeast. Instead, they get their “lift” from baking powder. Stir the liquid into the dry. One of the most important things to remember (with all quick breads) is not to overmix the batter. This can develop the glutens in the flour and cause toughness. It’s ok (it’s actually best!) if there are still a few streaks or lumps of flour in the batter when the blueberry muffins go into the oven. Don’t worry, they will bake out! And you’ll be happy, because your muffins will be as tender as can be. Muffins, certain breads, pancakes, waffles, scones, shortcakes, biscuits, and baked donuts all fall into the quick bread category. So, many of them are sort of interchangeable. In other words, you can bake a muffin recipe in a donut pan or a loaf pan, or put a pancake batter in a waffle maker. As always, if you choose to do this, it can affect the yield and bake time, so just keep an eye on them as they bake. You’ll know your quick breads are done when they feel springy and light, and a toothpick inserted in the thickest part comes out clean. Ok, let’s get into the nitty gritty here. Blueberry muffins. Muffins are a “quick bread,” which generally means that they rely upon chemical leaveners, rather than yeast, to give them “lift.” Therefore, they are quicker to make. Because you don’t have to knead them or wait hours for them to rise. However, in my blueberry muffin journey, I also found that when they say quick bread, they also mean work fast. The minute those wet ingredients get combined with the dry, the leavening agents are already fired up. They are lifting, baby, so get ’em in the oven quick (!) to make the most of it while you still can. SHOULD I USE FRESH OR FROZEN BERRIES? 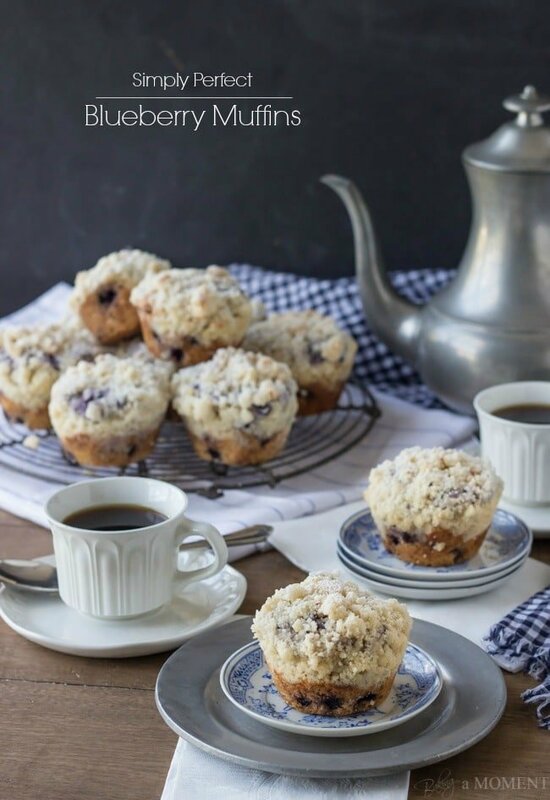 I have made this blueberry muffin recipe with both fresh and frozen blueberries, and either way, you won’t be disappointed! Since we are on the cusp of blueberry season right now, I used fresh blueberries for the muffins you see in these photos. The fruit becomes soft and jammy as the muffins bake, there are pockets of juicy blueberry in every delicious bite. But I have to say, I really prefer frozen berries in my blueberry muffins! And not just any frozen berries; frozen WILD blueberries! They are in a class by themselves. They’re small and they pack such an intense blueberry flavor punch. Because they’re so tiny, you get tons of them running all throughout your muffins. They’re easy to find in most US grocery stores, right in the frozen foods section. I highly recommend keeping a bag in your freezer at all times, for whenever that blueberry muffin craving strikes! Just fold them into the muffin batter while they’re still frozen solid. That way they won’t bleed quite so much juice. Also, I learned a thing or two about blueberries along the way, and I want to be sure and pass along my scientific findings. 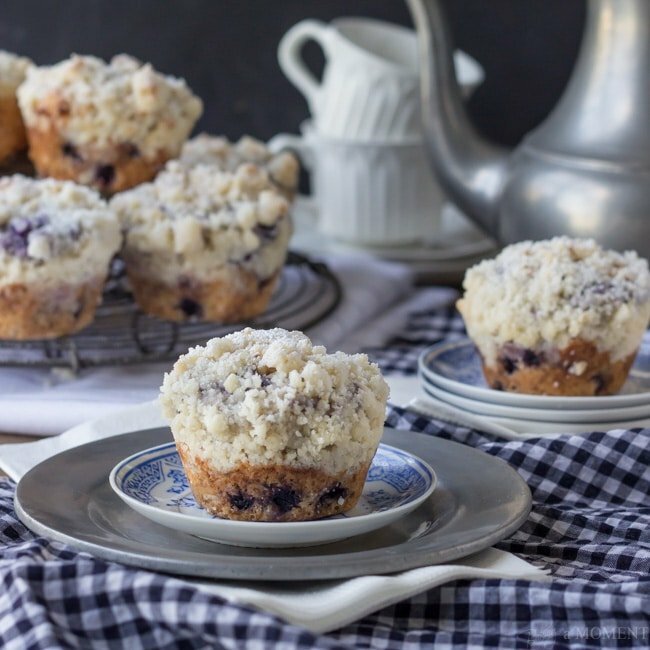 Since we are right on the cusp of berry season now, I’m sure you are all excited about the idea of picking up a few pints of fresh blueberries, and baking them into some tempting muffins. I hate to burst your berry bubble, friends, but don’t. Frozen blueberries are THE way to go. And I’m not just talking any old frozen blueberry. I’m talking WILD blueberries. Don’t worry, they are easy enough to find at a regular supermarket, right in the frozen foods aisle. They truly make all the difference. 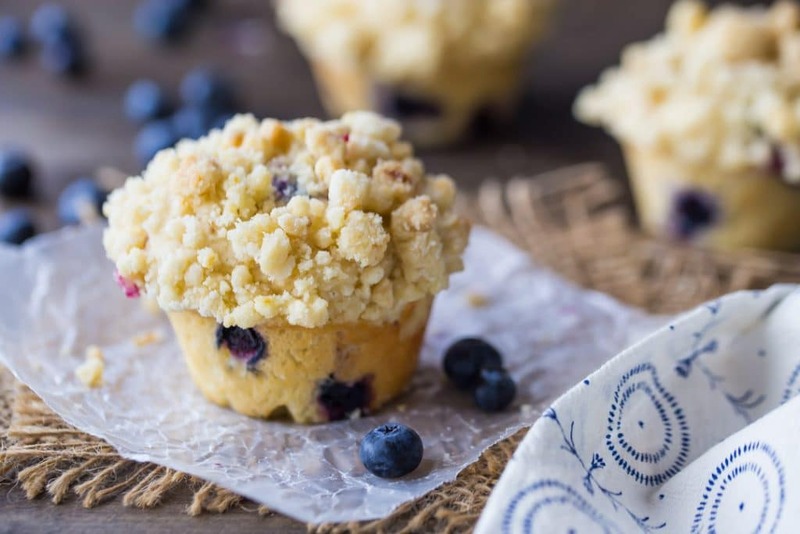 They are sweeter, pack a bigger blueberry punch (without being at all tart), and smaller, which means you are going to get lots of little blueberries running all throughout your muffins. Using fresh blueberries will give you big, empty pockets of sometimes sour pulp, so I really do think it’s worth your while to go for the frozen wild blueberries. Ok, I’m done being bossy now! HOW LONG DO BLUEBERRY MUFFINS KEEP? You can keep these blueberry muffins at room temperature for a day or two. Normally, I would say to put anything freshly baked in an airtight container, but quick breads are different somehow. They tend to get soggy, so I prefer to just *lightly* cover them with plastic wrap or foil. Enough so they don’t dry out, but with a little air flow so they don’t become wet either. In the fridge, they’ll last up to a week. But my favorite way to store them is in the freezer. Just pop them into a zip-top bag, and at breakfast time, thaw them in the microwave for about 30 to 45 seconds. They come out perfect! Just like the day they were baked. They should stay good in the freezer for several weeks. I know I’d be a happy mommy if these appeared on my bedside table on Sunday morning! More great breakfast recipes on my “Breakfast & Brunch Recipes” Pinterest board! The most Perfect Blueberry Muffin Recipe ever! 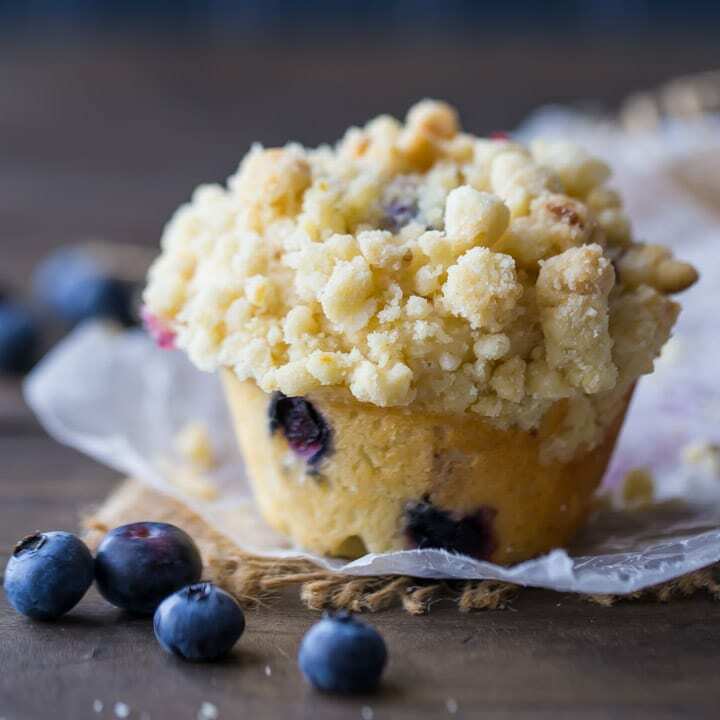 These Muffins are Light and Moist, studded throughout with sweet Berries, and sprinkled with a Crunchy, Buttery Streusel Crumb Topping. They're Quick and Simple to make, so whip up a batch for Breakfast or Brunch! Toss the melted butter, flour, sugar, salt, and lemon zest together with a fork, until crumbly. Preheat the oven to 425 degrees F and lightly mist a muffin pan with non-stick spray. Place the flour, sugar, baking powder, and salt in a medium bowl and stir with a whisk to combine. Set aside. Whisk the melted butter, Greek yogurt, milk, eggs, and vanilla together in a large liquid measure until well incorporated. Pour the liquid ingredients into the dry, and stir together with a silicone spatula or wooden spoon, just until ALMOST combined (you should still see streaks of flour). Divide the batter equally between each well of the muffin tin, and top with the reserved streusel. Bake for 5 minutes at 425 degrees F, then turn the oven temperature down to 350 degrees F (without opening the oven door), and bake for an additional 15 minutes, or until a toothpick inserted in the thickest part of a muffin comes out clean. *If you don’t have buttermilk, you can substitute by stirring 1 tablespoon of lemon juice or white vinegar into 1 cup of regular milk. Allow the mixture to stand for 5 minutes, or until thickened and slightly curdled. And now for the best part! A bunch of my friends and I are thrilled to be able to offer you a giveaway from Hodgson Mill! Not too shabby, right? And Hodgson Mill products are really wonderful. I use their almond meal all the time for macarons, and I actually used their unbleached white flour for this blueberry muffin recipe! Enter with the Rafflecopter widget below! The giveaway: Eligible to one (1) winner residing in one of the 48 contiguous states. Must be 18 years of age to enter giveaway. Starts 9 am 5/7/2014 (EST time) and ends 11:59 pm 5/14/2014 (EST time). To enter the giveaway, you must participate in at minimum, one of the listed entries in the Rafflecopter and an email address must be provided. Winner will be announced via email and must respond to the subject line: “Congratulations You’ve Won Baking a Moment’s Hodgson Mill Giveaway” from BakingAMoment@gmail.com within 24 hours of deliverance. Failure to respond will forfeit your chance in winning and a new winner will be chosen. Hodgson Mill will ship the product(s) directly to the winner. Please be advised items may appear different from the photo shown. Baking a Moment and its owner are not held responsible for missing/broken items received by the winner. Good luck and thank you for your entries. There will be more fun recipes as well as giveaways coming soon! See more at https://bakingamoment.com. I’m so excited about this recipe because I have bags of blueberries in the deep freeze from summer. And streusel topping just makes me happy in a ladylike way. I’m still trying to figure out how you made those blueberries look so perfect in the cut in half muffin. Perfect! Frozen blueberries are great for this recipe, especially the little bitty ones. That way they disperse evenly throughout the batter. 😉 Thanks so much for commenting, Laura! Thank you for hosting such an awesome giveaway too! 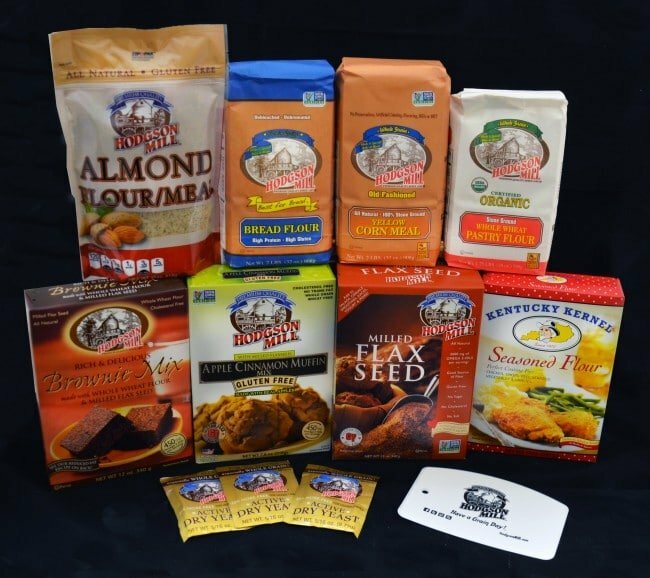 great giveaway and love the blueberry muffins!! Your simply perfect series never ceases to amaze me! These look wonderful! Allie, your beautiful pictures always make me want to come join you for tea! And enjoy one of these perfect muffins! Beautiful as always, Allie. Love the crunchy topping! Could you double check your topping? Glad we caught the oops! I did enjoy the texture of the muffins! I’ve been trying to find a “go to” muffin recipe. I think this is it. These muffins look amazing, Allie! You’re right…they are pretty and puffy. 🙂 I’ve found wild frozen blueberries at Trader Joe’s and I love the small size of them. 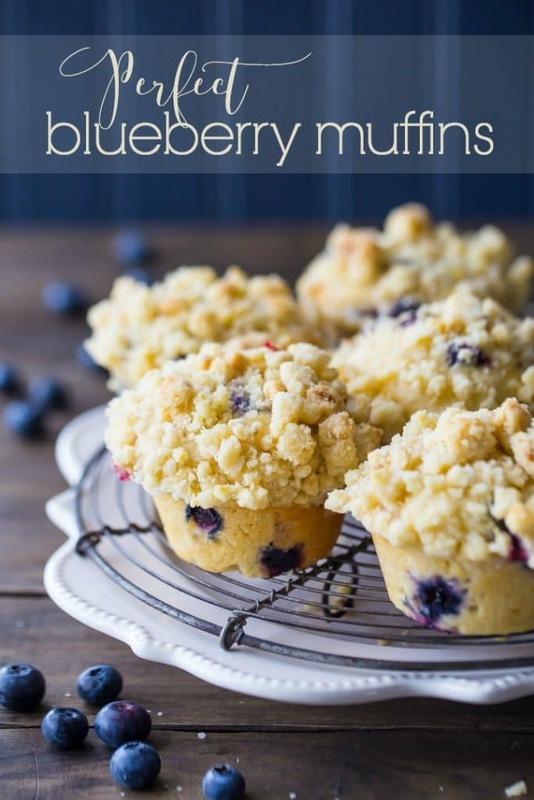 Your muffins are just studded with them, and since it’s all about blueberries for me lately, I’m loving these! Thank you so much, Marcie! I really think those frozen wild blueberries make all the difference! I don’t mind you being ‘bossy’ at all here, Allie. These muffins really do look perfect. Just look at all those blueberries packed in there! And I loved all your tips. This one is getting pinned for sure!! Thanks! Those muffins DO look simply perfect! I wish I had some for breakfast this morning. All that streusel OMG! I know, the streusel was really like the icing on the cake. My son went crazy for it! I’m so happy you stopped by, and thanks so much for the sweet comment! Thank you, Kelly, for the great feedback! I totally agree with you about the top being the best part, and honestly, that was what took me so many tries to perfect! The first time I tested the recipe, right out of the gate it was delicious, but I wanted that puffy top! And you are so right about the wild blueberries- the flavor is incomparable! 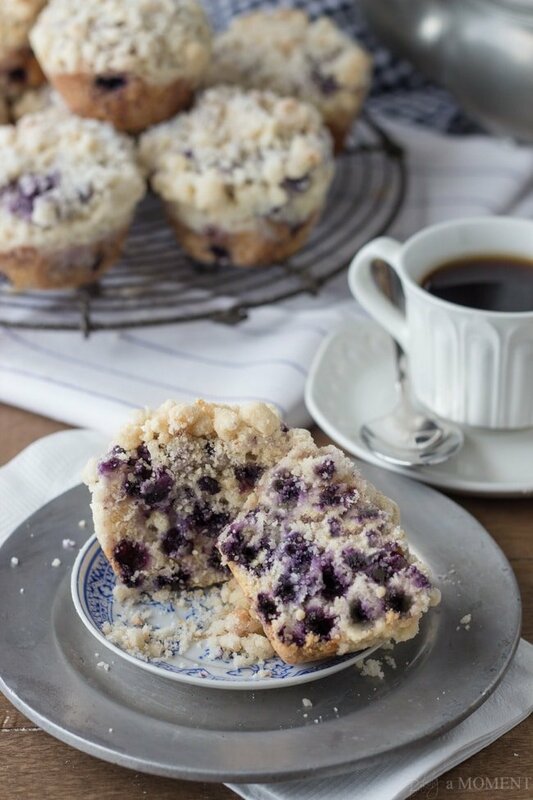 I don’t think there’s anything better than a perfect blueberry muffin, love your photos! So true! 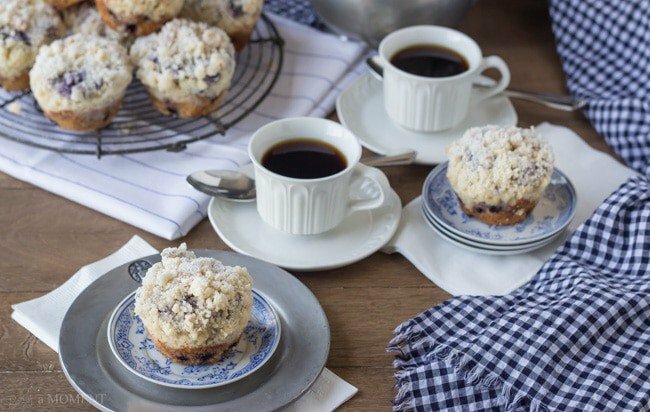 A blueberry muffin + a cup of coffee = perfection! Thanks so much for the sweet comment, Sue! These really do look like the perfect blueberry muffins! And blueberry muffins are my favorite – how’d you know?? : ) My husband always wants to kill me when I keep tweaking and re-tweaking a recipe and I make him eat it a little too often haha ahhhh the life of living with a food blogger! Good to know I’m not alone, Ashley! Thanks so much for the sweet comment. Hope you have a great weekend, dear! Allie, these are the most beautiful, impressive blueberry muffins I’ve ever seen. The shape is perfect, the crumb on top is perfect, and WHOA lady did you ever pack a ton of blueberries in there. I’m a huge fan of frozen wild blueberries – I have them in my freezer year round and I can totally attest to the fact that they’re the best for baking. My problem is that no matter what I do, if I just fold them into my batter, they always bleed and the entire muffin/loaf/cake/whatever is purple. How did you get them to not bleed here?! You’re a miracle worker. These are indeed simply perfect! Wow! These muffins certainly do look perfect! Great work, and I am so glad that we all can benefit from your persistence on perfecting this blueberry filled delight! Love it! Oh ya, I’m relentless! Lol, it’s not always a good quality, but when it comes to muffins it works to my advantage 😉 Glad you enjoyed, Tahny! Thank you for all the hard work that went into this recipe because they seriously look PERFECT!!! That crumb topping is my favorite part – can’t wait to try these!! Allie, these DO look perfect. 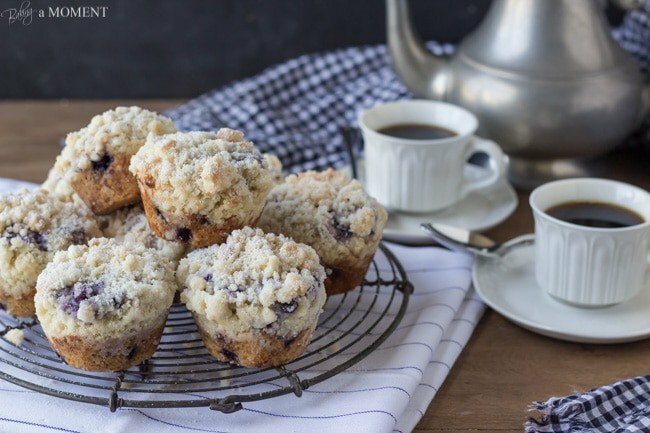 Blueberry muffins are one of my all-time favorite ways to start the day. I love how chock-full these are with blueberries. And that streusel topping looks undeniably addictive. Thanks for sharing this recipe! My pleasure Jamie! I had a lot of fun working it out and I was really happy with the end result! I’m so glad you enjoyed. Thanks for the great feedback, sweetie! Oh Allie! These muffins truly look perfect! So gorgeous!! Pinned! Allie, these look great. 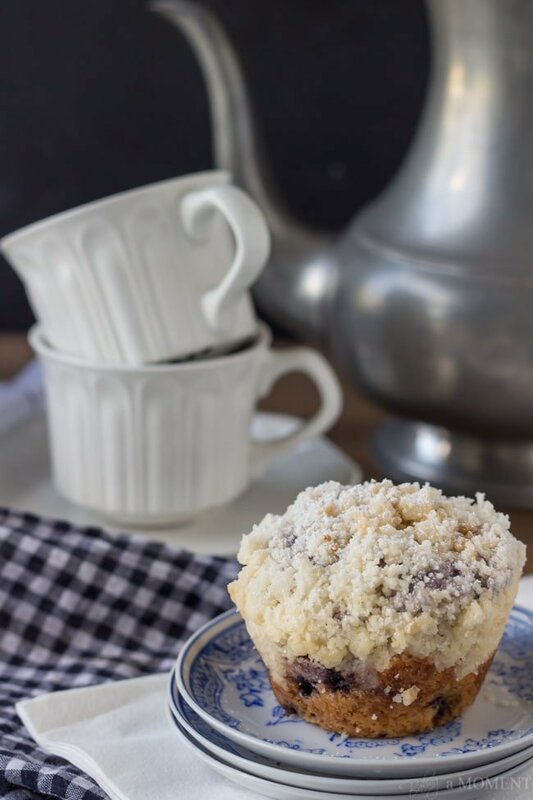 I love blueberry muffins and with the streusel top I think I love them now even more. This has been featured as one of my favourites over at Sweet and Savoury Sunday. Stop by, grab a button and link up again with us this week. Have a great day! Thank you so much Laura! I just linked to you at the end of the post. I’m so happy for the feature! Thanks again and hope you are feeling better sweetie. Congratulations on your feature at the Sweet and Savory Sunday link up! These muffins look amazing! These look so delicious!! Pinned to my breakfast board! a printer friendly button for just the recipe. Hate making things off my iPad as I am afraid of getting my computer dirty…thanks…love your recipes but want to print. Sweet plump berries and that mound of delicious streusel have me sold! Picture perfect muffins! These blueberry muffins look heavenly. I have several bags in the freezer that I need to use up before the new crop comes here in July. Only 1 question…since you have yogurt or sour cream or buttermilk in the batter, shouldn’t there also be baking soda in the recipe? Maybe instead of baking powder? These blueberry muffins look so amazing! They will be a perfect addition to Mother’s Day brunch! These are the most perfect looking blueberry muffins! It looks as though all of that testing paid off – these muffins look amazing! Hi! I love that you tested these muffins so many times 🙂 If I wanted to make them without the crumbles on top, do you have any advice on how I should adjust the sugar amount in the muffin recipe? Hey Cat! I actually wouldn’t adjust the sugar at all- the muffins are just the right amount of sweet as-is, with or without the crumb topping. Good luck and enjoy! These muffins look amazing! BUT!, I have a question. Your recipe all’s for melted butter in your wet ingredients, but in the video you didn’t add any. Do I add the butter to the muffins or not? Yes, always follow the recipe as written. I made these today. I used sour cream because that’s what I had on hand….absolutely delicious! So glad to hear that Tina! Thank you so much for the positive review! It’s a very stiff batter; that’s what helps the muffins to come out nice and tall. Watch the video (just above the recipe card), and you’ll see what I mean! I’ve had to bake the muffins- on convection even- for twice as long as directed. Is it really only supposed to yield 12 (huge) muffins? That’s correct Tara- 12 muffins and they do bake up pretty big and tall. What kind of berries are you using? Could it be that they are very wet? I made them in a regular muffin pan- and I had enough batter for 12 muffins and 12 mini muffins. I thought the mini muffins would be done much sooner, but they still had to bake the entire 20 minutes (at 425 then 350). Still waiting on the regular size to get done after 30 minutes. They look great though. Also, it didn’t take me 15 minutes to prepare – maybe 25 with melting the butter and grating the lemon. Thanks for the recipe, I think I’ll make them again. So glad you’re making this recipe! Hope you enjoy! I believe it goes by the name “Plain Flour,” outside of the US. When do you add the topping? Hi! I’ve made these muffins twice now, one half batch and one full, and I have a question – is the batter supposed to be very thick and dry? Both times I’ve had to add an additional generous splash of milk to get the dough even close to combined. As a result my muffins came out slightly tough, I think from accidentally overworking the batter (it wasn’t blueberry juice as I drained and dried off my frozen berries very thoroughly before mixing them in – I don’t think a single drop of juice made it into the batter). I’m wondering if there’s anything I can do to prevent this? Perhaps adding more milk before I combine the dry and wet? Hey Christine! Yes the batter is meant to be very thick and stiff. This way the muffins bake up nice and tall! You can get an idea what that’s meant to look at if you check out this video: Crumb Cake Muffins. <- There are no blueberries in this one, but the base is the same. Hopefully that's helpful! Hi Allie. I made these today and they were divine. I used fresh blueberries. I would like to try the frozen ones. Can you please tell me if you add these whilst still frozen to the batter? Thanks Allie for amazing recipes. So happy you like them Terri! I usually add the berries in while still frozen. Hope that’s helpful! Hi, I found your recipe and I’m trying this next weekend. Do you have suggestions for converting this recipe from 12 [regular] muffins to 6 oversized muffins? Temperature and time adjustments? Hey Veronyka! So happy you’re going to try this recipe! For oversize muffins, I would keep the temperature the same, and you’ll know they’re done baking when a toothpick inserted in the thickest part of a muffin comes out clean or with a few moist crumbs. Good luck! Three cups is exactly the right amount! The batter will be quite stiff and that will help your muffins to bake up nice and tall. Hope you enjoy! Do you think I could use almond milk instead of regular milk? I think that should work! Good luck! Is the 3 cups of flour listed correct. The batter was so thick I couldn’t mix in blueberries. I wound up adding more liquid. They are not out of the oven yet and I am concerned that they will not be very good. It’s correct! I make this recipe quite often. Be careful not to pack the flour into the measuring cup. There is a video just above the recipe card, so you can see what the batter looks like. It’s more of a blueberry bread than it is a muffin. But it is delicious and the crumble topping is what makes it. The kids loved it. Will definitely make it again. Very happy you liked it Sharon! Thank you for the positive review! These were hands down the best blueberry muffins I’ve ever made. If someone is contemplating making this recipe, don’t overthink it and just make them. Very delicious and beautiful photography. And that crumb topping! Total winner. These were hands down the tastiest blueberry muffins I’ve ever made. Thanks for sharing such a great recipe. And that crumb topping,…the best! So happy you enjoyed, Sherri! Thanks so much for the great feedback!